Flawed though it is, the show remains a draw, and that is why the Met revives every other year. The first of this season's two runs opened last week. Tuesday night’s performance showed some of the inherent difficulties in mounting this Asiatic extravaganza on such a regular basis. Tuesday night’s performance was also an historic occasion, as it was star bassbaritone James Morris’ 1,000th performance on the Met stage, a fact acknowledged with a small ceremony at the end of the first act. His Turandot was Oksana Dyka. Making her grand entrance halfway through the second act, she showed similar qualities to her suitor: lots of volume and accuracy but not much in the way of heart-melting beauty. Then again, as the two singers shouted over the surging, rolling wave of extravagant orchestration, one could argue that this couple were certainly suited to each other. That proved evident in the climactic Act III duet (where the music written by composer Franco Alfano to complete the opera after Puccini's death) was treated with more respect (and slower tempos than usual by conductor Carlo Rizzi. The best singing of the night came from soprano Maria Agresta as Liù. This humble slave girl is the real heroine of the opera, standing up to Turandot's minions. In the third act, she facies torture and finally death, stabbing herself in her effort to preserve the Prince’s identity. Agresta's singing in the first and third acts had that genuine quality of the Italian tradition, with little ornaments on the notes at the end of "Signor, ascolta" and a clean, thrilling register that shone brightly in the darkness, As Timur, James Morris was exceptional, the veteran singer marking his milestone with a heart-wrenching farewell to his little guide after her suicide. On the podium, Rizzi had a lot of traffic to manage . 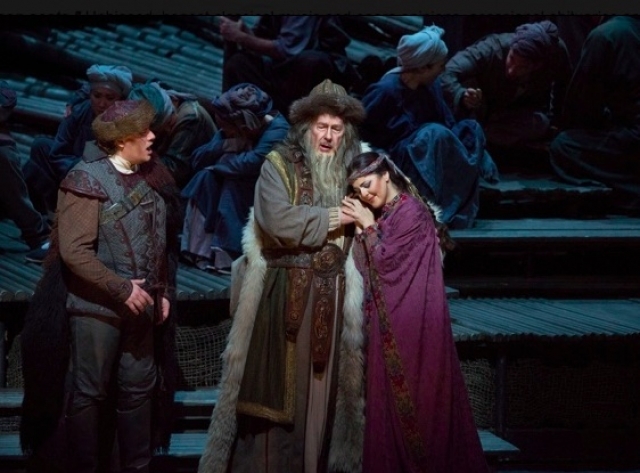 Turandot features brigades of choristers playing Peking peasants, child monks and various types of mandarins. However, the veteran conductor knew how to let this music (and his singers) breathe, giving a sweet sonority to Puccini’s (and Alfano's) writing. Even rarer was his ability to generate real dramatic tension in the Riddle Scene. In this sequence, the ritual of the three questions did not overcome the dramatic tension of the moment as tenor and soprano squared off.